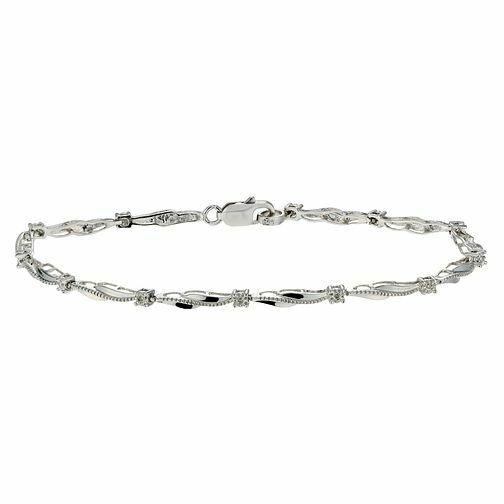 Radiating elegance, this shining sterling silver bracelet features classic milgrain detailing, and is set with subtly sparkling diamonds for just a touch of luxury. A feminine and versatile piece of jewellery for the modern, sophisticated woman. Sterling Silver Diamond Bracelet is rated 5.0 out of 5 by 4. Rated 5 out of 5 by Anonymous from excellent item bought this for my fiancee to wear at the wedding to match all the other diamonds she will be wearing that day. it sparkles beautifully in the light and is really dominant on the wrist. this is highly recommended as the craftmenship is excellent. Rated 5 out of 5 by Anonymous from Beautiful Bought this as a wedding gift for my sister in law, it's a beautiful bracelet - very elegant. She loved it as did all her friends and family. Delivery time was good - all round good service.